﻿ When I Say "Aiptasia," You Say "Pest." 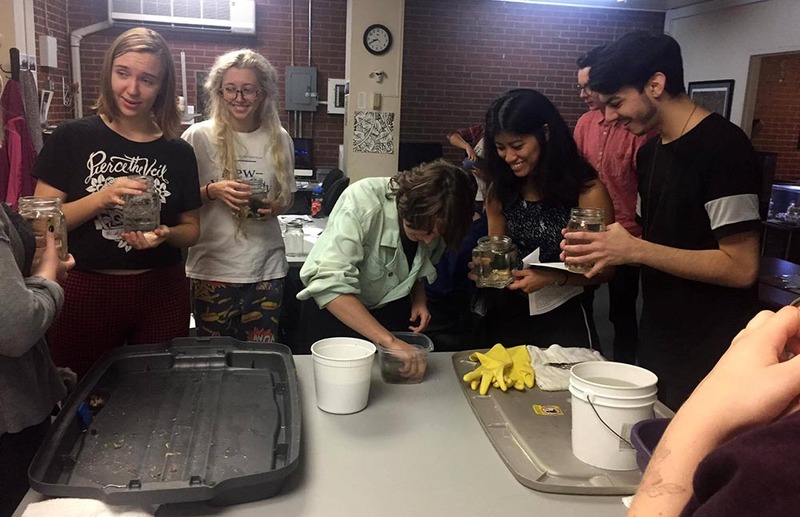 TJ Holland leads a workshop for would-be jar aquarists at Pratt Institute. You read that right. As the brainchild of recent graduate and former President of the Pratt Reef Club TJ Holland, we are entering the fourth year of our experiment with elevating the profile of these fascinating and hardy animals from loathsome to awesome. 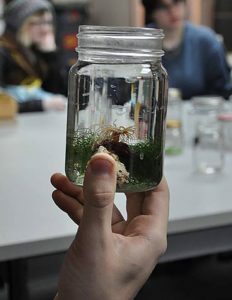 For the fourth consecutive year, Pratt students were invited to bring their jars and take home Aiptasia pets. First, a little background information. Pratt Institute is a leading College of Art and Design located in Brooklyn, NY. It is where I work, and it is also where I house my nearly 1,000 gallons of marine aquariums that includes my full-blown 240-gallon reef known affectionately as Prattreef, as well as systems dedicated to anemones, seahorses, a dragon moray, and more. A select few students act as my aquarium assistants as part of the work-study program. 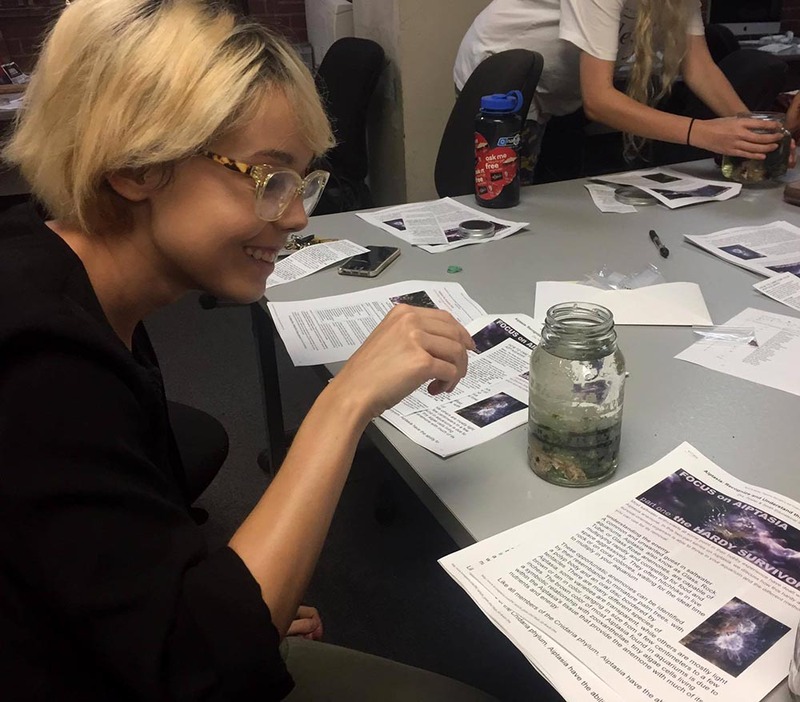 Born from this student involvement with the tanks, TJ was able to create an official Pratt student aquarium club. The problem: despite broad interest, most students don’t and can’t keep aquariums beyond the size of a Betta or goldfish bowl. Still, interest is remarkably high. Enter a creative solution to a perennial problem. Can this small environment really work? One day, as we embarked on an Aiptasia-nuking mission in the reef, TJ remarked that it was sad that we had to kill them because they really are quite beautiful. I launched into the usual explanations of “invasive pest, scourge of the reef-keeping world, impossible to eradicate, must be eliminated,” etc. She understood, but wasn’t satisfied. I recounted the early days of reef-keeping before corals were thought to be viable aquarium residents and tanks full of Aiptasia were exciting successes. I thought for a second and didn’t really have an answer. “Maybe?” We decided to try it and find out. 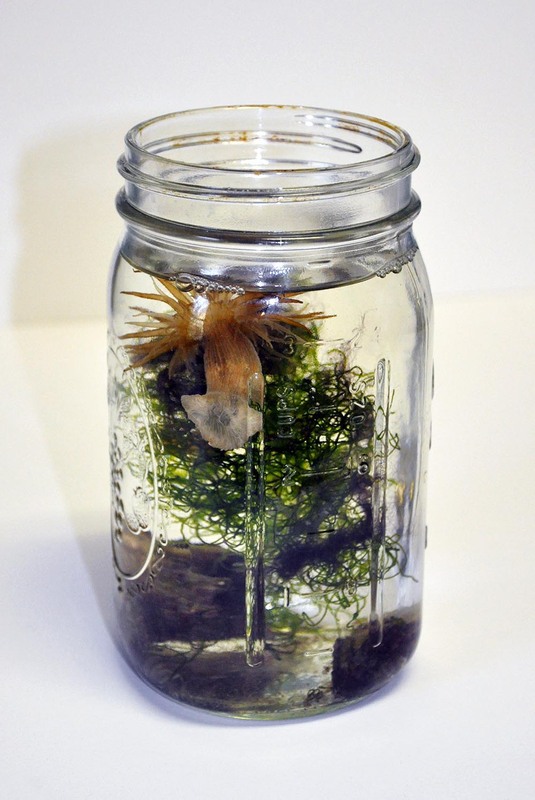 We settled on the simplest of setups: A Mason jar, a small piece of live rock to provide some bacteria, and a small clump of Chaetomorpha algae to help with nutrients and oxygenation. Mature salt water was taken from one of my systems to fill the jar. A waterline mark was made on the jar, as we knew stability in terms of salinity would be one of the biggest challenges. We also knew we needed some light, and that temperature stability would be the other major factor. 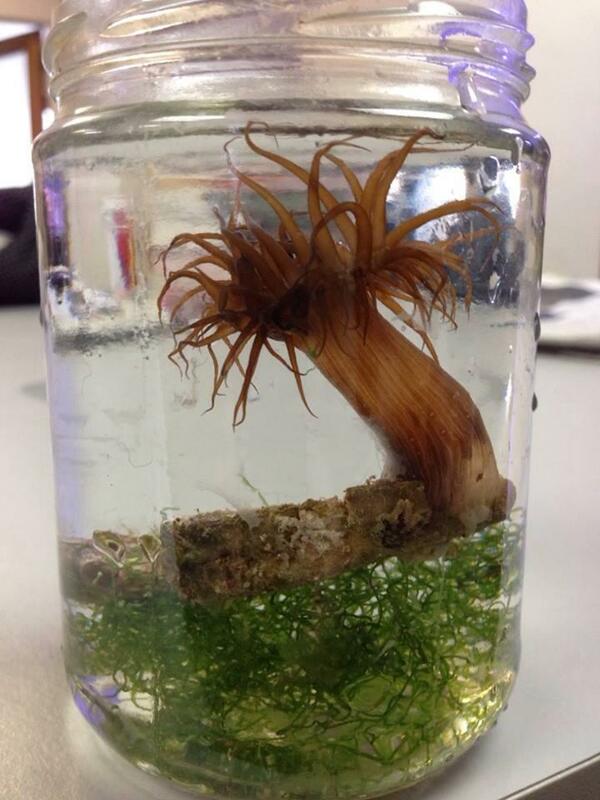 Aiptasia anemone, Chaetomorpha algae, and a small piece of coral rubble, key ingredients in the Pratt-style Nem Jar. With a little experimentation, it was determined that either a small desk lamp or ambient, but not direct, light from a window was more than sufficient. The windowsill proved too volatile in terms of both lighting and temperature fluctuations, but a desk or table a foot away and normal room temperature seemed to suffice. Our little Nano Nem, as TJ later termed it, seemed to thrive with just the minimum of care. Specifically, we topped off the water regularly using de-chlorinated tap water from a drinking water filter, bottled water, or water left to sit overnight, and once or twice a week the Aiptasia were fed a few small granules of pelleted food. It really could not get any easier. Success was sufficient that we decided to see if students with no practical aquarium experience at all could keep some Aiptasia as pets in their dorm rooms. The club put out an announcement for an “Anemone in a Jar” building night, and the turnout was unbelievable. We counted nearly 60 students who showed up, jars in hand, willing to give it a try. 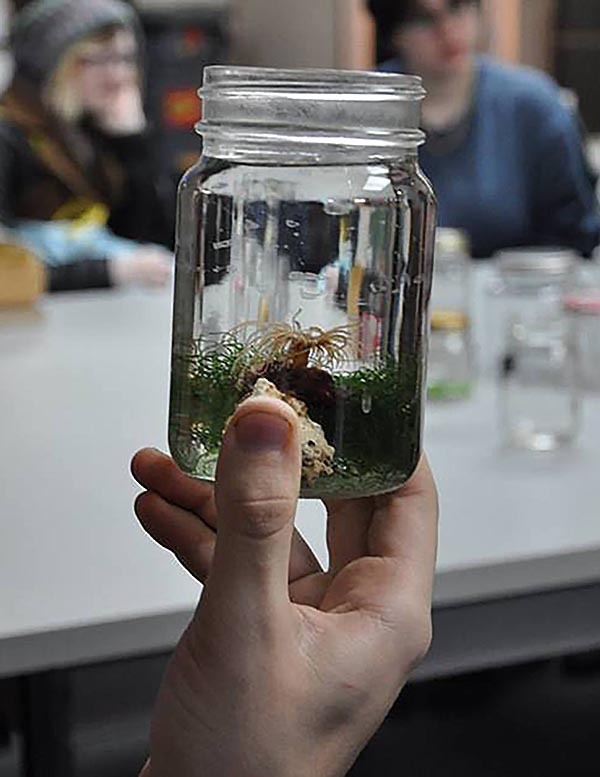 These Pratt students’ excitement is undeniable as they assemble their anemone jars. The students were given a small demonstration and a handout, and off they went, trundling across campus, full jars in hand. It was quite a sight! 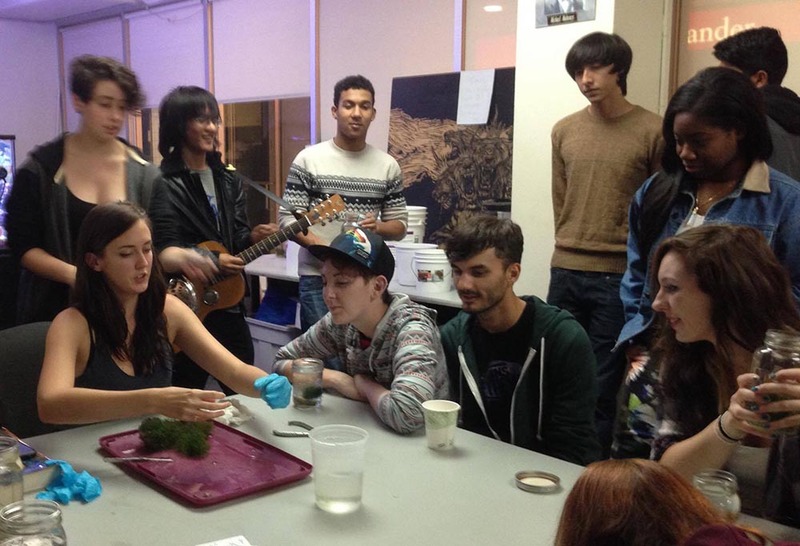 Armed with husbandry info, a Pratt student marvels at her new micro-reef. We were not able to track the success and failure rate very accurately, but it seemed that some jars failed almost immediately, much to the dismay of their owners. Some did very well, lasting months, and we have two reports of jars lasting a year or more. Our guess is that many students forgot to top off frequently enough, and most overfed. Vacations were also a major problem. 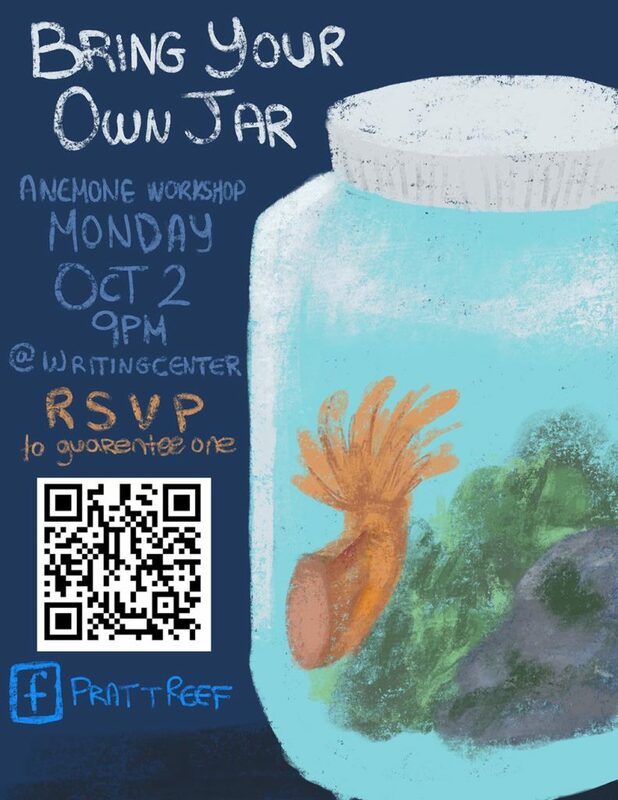 Still, we consider this experiment a success, and we hold these jar build events every fall. The builds are fun, the jars quite pretty, and the educational value is high. We recommend you give it a try! So when I say “Aiptasia,” you say “pest.” At Pratt, we say “pet” instead. Randy Donowitz has been keeping aquariums most of his life. In 1994 he purchased his first marine system, a simple 55-gallon reef setup, and he has been an incurable coralholic ever since. Randy’s articles have appeared in numerous hobbyist publications, including Aquarium Frontiers, Advanced Aquarist, Marine Fish, Reef USA Annual, and Aquarium Fish magazine. Currently, he is the Senior Editor for Reefs Magazine and Reefs.com. 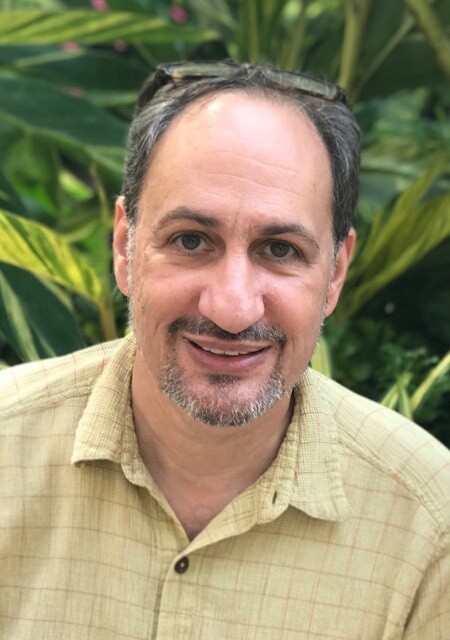 During his spare time he curates and maintains the 6-system, 700-gallon coral reef display at Pratt Institute in Brooklyn, NY, where he enjoys the privilege of sharing his knowledge and love of the hobby with students, staff, and community members from around the Tri-State area. Are you successfully keeping a pico reef in a jar, vase, fish bowl or other extremely small containers? We’d like to hear about your experiences and see your results. Send us an email with more information. I think this is a great project! I would like to try it in my sixth grade classroom. Is there any handouts or lesson plans that can be shared about this project?